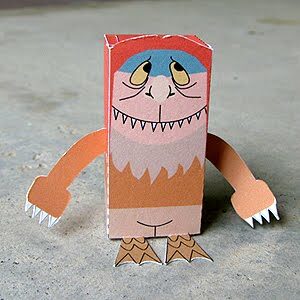 This paper toy is the Sipi, based on the children’s comic / film “Where the Wild Things Are“, the papercraft is designed by Toy a Day. Where the Wild Things Are is a 1963 children’s picture book by American writer and illustrator Maurice Sendak, originally published by Harper & Row. The book has been adapted into other media several times, including an animated short in 1973; a 1980 opera; and a live-action 2009 feature-film adaptation, directed by Spike Jonze. The book had sold over 19 million copies worldwide as of 2009, with 10 million of those being in the United States.